Q：What are the benefits of the Clean-Polisher ? A：With Clean-Polisher, you can use various cleaning accessories to clean the bathroom, kitchen and even BBQ grill in the garden. Moreover, you can replace the cleaning accessories to polish your car in the garage with the same tool. It is powered by a rechargeable battery, so you no longer have to search for a power outlet while using. Besides light-weighted and convenient for use, its ergonomic design allows easy one-handed use. Q：What about its rotating speed and torque output ? A：The Clean-Polisher rotates at 750rpm under no load condition. It can generates a maximum 20Kg-cm torque. Its power consumption is about 48~72 watts. Q：How long has it for using at one charge ? A：It has thirty-minute run time continuously. You can use it to clean entire house or wax and polish more than two cars at one charge. A：For initial use, charge the machine till the indicator light of the charger turns green. 1. To assemble/disassemble, hold the neck of the machine with one hand (see fig. A) and push into/pull out the brush with the other hand. 1. Attach the Sponge Pad onto the Polishing Disc. (see fig. C). 2. Extend the elastic band of the Polishing Mat to fit around the Sponge Pad (see fig. D). 3. Insert the assembled Polishing Disc into the opening of the machine directly (see fig. E). Q：How do I remove the accessories ? A：To disassemble, hold the neck of the machine with one hand (see fig. A) and pull out the accessory with the other hand. Q：How do I charge the Clean-Polisher ? 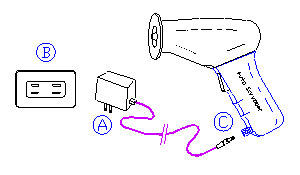 A：Plug the Charger (A) into the power outlet (B), and insert the output plug of the Charger into the charging hole in the machine with its cap lifted (C). A Red LED light indicates that the battery is being recharged, and a Green LED light indicates that the recharge is completed. cut off the charging automatically when the battery is fully charged, and the indicator light turns Green. Q：Can I use other adaptors or chargers to charge the polisher ? A：No! You should use only manufacturer’s charger. Using other chargers or adaptors may cause danger. Q：Under what condition should I stop using ? A：Stop using the machine while it turns slowly. Recharge it and keep its power at high level, which will maintain the battery of the product in good condition. Q：What should I do if my lean-Polisher drops into water ? A：Should the unit fall into water without the Charger-hole Cap closed, shake out loose liquid and allow air-drying overnight. Q：What should I do for storage ? A：Always store the appliance indoors or in a cool place. To keep the rechargeable battery in good condition, the polisher should be recharged at least every three months. Tek Maker Co., will repair or replace the product at its option and expense for any defect due to faulty material or workmanship within the warranty period. But, the warranty is not valid if a defect is due to damage caused by incorrect use or unauthorized repairs. Furthermore, the warranty does not cover products that are subject to wear or that can be considered as consumables by their nature.